We have a cat and we study it almost every day by virtue of sharing our lives with him. The kids have learned how to feed him. They are not coordinated enough to pour water in his bowl. Or, at least, my fear of spills will not allow me to allow them that chore yet. The kids also open the door for the cat to go in and out of the house. Our cat lost its mommy in a storm and stumbled upon somebody’s porch. That somebody knew somebody who knew my husband was a cat lover. My husband took the kitten in and called him Izzy. One year later, I came along. I am not particularly fond of cats. In fact, I am allergic to cat dander. My first thought when I saw Izzy was, “I need to tolerate this one.” But I did more than tolerate him. One afternoon, as I was sitting on the couch in the living room, Izzy walked over to me and got into my lap. He started purring and suckling on my pant leg. He thought I was his mommy. He left a wet spot on my pant leg and won me over. I have written two books about him, but never edited them properly. I had children instead. We took some magnifying glasses to Izzy’s fur for this particular cat nature study. My son noticed a dried leaf shaped as letter “P” caught in Izzy’s fur. He did not need a magnifying glass for that. With all the catkins outside, our cat is bound to pick up some. We made two notebooking pages about Izzy. I gave my daughter a simple blank piece of paper and we glued the cat study topper from the Outdoor Hour Challenge May newsletter. For my son, I printed out the mammal notebooking page from the same blog. I filled both of them out as we talked about cats. My children are still too young to write themselves. As I read the Handbook of Nature Study to prepare for this lesson, I was surprised to read the recommendation that we train cats not to hunt for birds. I would have thought that a naturalist would want a cat to follow its natural instincts no matter what those may be. We have seen our cat hunt for mice. We have observed his fear the day after a black bear visited our yard. 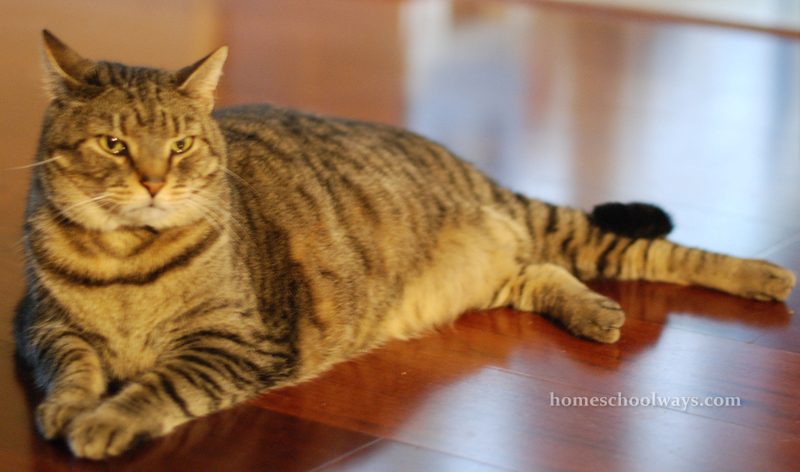 We have had to deal with putting away dead mice, moles and birds – always daddy’s job. We have had to brush his fur or put up with cat hair on our sofas. Sometimes, both. I have sneezed many times not realizing I had just sat in our cat’s latest favorite spot. When the vet diagnosed our cat as a diabetic last year, we could not put him to sleep. Instead, we chose to give him shots. I do not know how I got the courage to give him his shots, but I did. 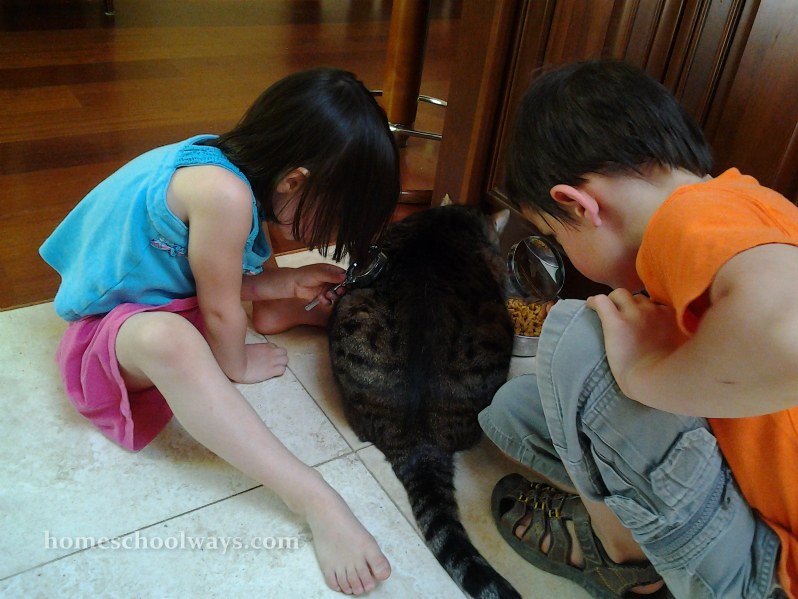 The kids watched me and daddy as we administered the cat’s shots and were amazed by how passive the cat was. We were, too. We also fed him less and let him go outside more. Exercise, a leaner diet, plus the insulin shots did the trick. His blood sugar levels went back down and he did not act as sluggishly as before. He actually got better. The vet declared him healed. All this to say, we love our cat and study him daily in our homeschool. For other Wonderful Wednesday nature studies, please click here.